Cairo in the 1860s is a bustling metropolis where people from all walks of life mix and mingle, mostly in complex harmony. When evil ghosts and unquiet spirits stalk the city’s streets, the Guard are summoned—six young men and women of different cultures, backgrounds, and faiths, gifted by their Goddess with great powers. While others of the Guard embrace their duties, their leader, British-born Beatrice, is gripped by doubt. What right has she, a bookish, sheltered, eighteen-year-old, to lead others into battle? Why isn’t dark-eyed, compelling Ibrahim, who is stronger of will than Beatrice, the one in charge? Ghosts maraud through Cairo’s streets, heralding a terrible darkness. Beatrice and her Guard have little time to master their powers; a great battle looms as an ancient prophecy roars toward its final, deadly conclusion. This enchanting prequel to Leanna Renee Hieber's gaslamp fantasy, Strangely Beautiful, returns to print after more than a decade, edited and revised for Tor's publication. LEANNA RENEE HIEBER is the author of The Eterna Files and Eterna and Omega. 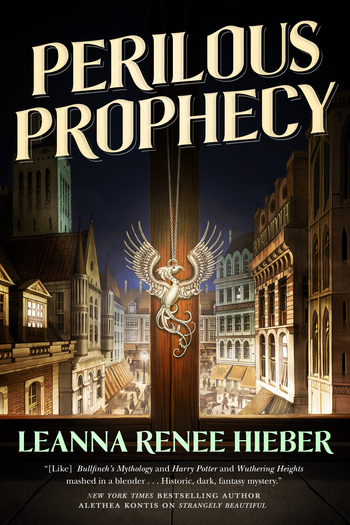 The Perilous Prophecy of Guard and Goddess is a standalone prequel to Strangely Beautiful. Rarely seen out of Victorian garb, Hieber has won several Prism Awards and was a finalist for the Daphne Du Maurier Award. A talented actor and singer, Hieber has appeared on stage and screen, including episodes of Boardwalk Empire, and regularly leads ghost tours in New York City.